How to Remove “Windows Has Detected a Malicious Virus On Your System” Pop-Up? Home »	Uninstall » How to Remove “Windows Has Detected a Malicious Virus On Your System” Pop-Up? Issue: How to Remove “Windows Has Detected a Malicious Virus On Your System” Pop-Up? Hello all. Today I get a really suspicious warning claiming “Windows Has Detected a Malicious Virus On Your System.” It does not look like a genuine alert from Microsoft. The following is the telephone number that I’m supposed to call to remove the virus: 877-384-3078. Have you heard something about that? Scammers are actively improving their strategies to lure people into scam affairs and shake down their money. While prize giveaway, online surveys, and similar scam types are still alive, tech support scam is currently the most popular technique used by cyber villains. While most of Tech-Support-Scams are really catchy, the others look rather fishy and unprofessional. “Windows Has Detected a Malicious Virus On Your System” Tech-Support-Scam would probably fall for the scam gimcracks. 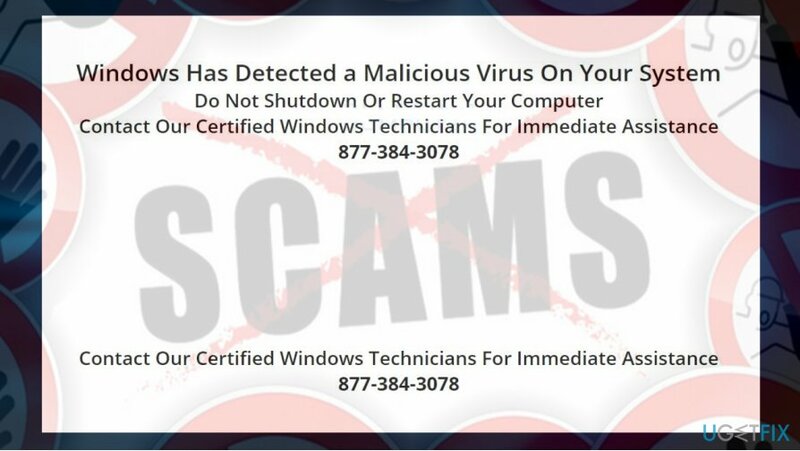 Although the Windows Has Detected a Malicious Virus On Your System scam exhibits all Tech-Support-Scam traits, it looks neither trustworthy, nor professional. Although it’s stated that “Windows” has detected a virus and that the provided number belongs to “Certified Windows Technicians,” the pop-up does not contain any Microsoft’s trademarks or specific information, for example, what virus was detected. If you received such and similar pop-up alert while browsing, that probably means that a potentially unwanted program (PUP) has been installed on your PC. 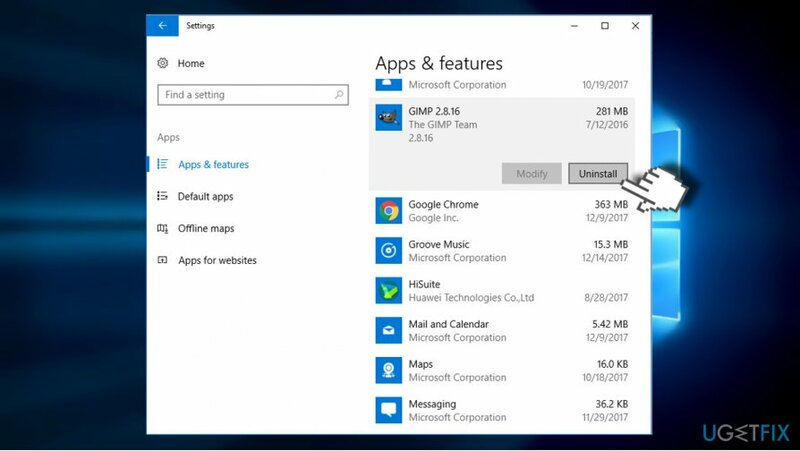 Alerts like Windows Has Detected a Malicious Virus are developed with an intention to trick people into calling highly-charged number, installing other untrustworthy programs or even establishing remote connection with hackers. To remove the “Windows Has Detected a Malicious Virus On Your System,” you’ll have to perform several steps. We highly recommend using a professional anti-malware tool for removing PUPs from the system. Our recommendation is Reimage, but you are free to use alternative anti-malware utility. It will ensure that all malicious programs, folders, and files have been removed. After running a scan with anti-malware, reset your web browser’s settings manually. Press Ctrl + Alt + Del or Ctrl + Shift + Del. 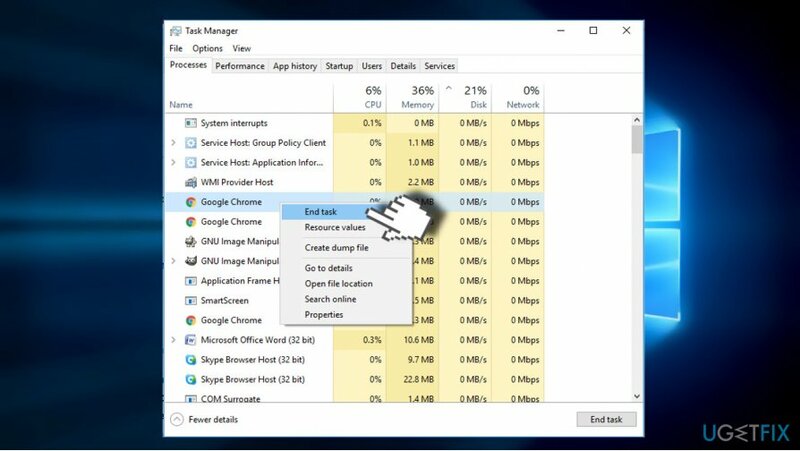 Open Task Manager and find your web browser's entry on Processes tab. Click on it and select End Task. Once done, you have to check the list of installed programs and find the one's that you are not familiar with. The installation date may help you to identify, which one may be potentially unwanted. Usually, the installation date of the unwanted program coincide with the emergence of the “Windows Has Detected a Malicious Virus On Your System” error. Carefully check the list of installed programs. If you detected a suspicious one, you can search for it online to find out if it falls for the PUP category. When all suspicious programs are uninstalled, reset your web browser. Otherwise, malicious “Windows Has Detected a Malicious Virus On Your System” scam files will remain active and the pop-up will keep reocurring. First of all, DO NOT restore the last browsing session because the screen will get stuck with the malicious pop-up again. Instead, start a new browsing session. Open Google Chrome and click on the menu icon (three vertical dots) at the top-right corner of the screen. Open Settings and select Show Advanced Settings. Find Reset Settings option and click it. To confirm the option, click Reset. 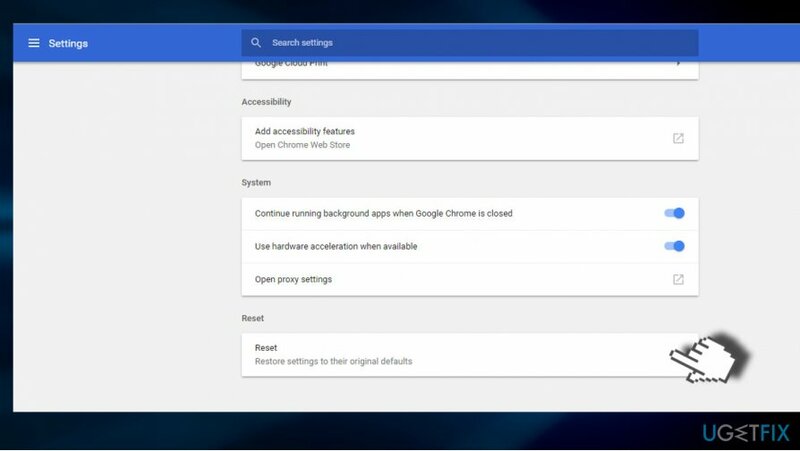 If you are nor using Google Chrome as your default web browser, you'll find Reset option of any web browser under Menu ->Settings. ^ Mary Landesman. Top Online Scams. Lifewire. Practical advice to help you live better with technology. ^ Chris Hoffman. PUPs Explained: What is a “Potentially Unwanted Program”?. How-To Geek. Online tech magazine. ^ How to avoid adware or potentially unwanted program (PUP)?. 2Spyware. The highest-quality information about malware and general security.